Looking to get your hands dirty and build some stuff on the Interwebs? Fancy yourself a developer, designer, or entrepreneur? This bundle is a deal (over 97% off) on a bunch of great tools for you. 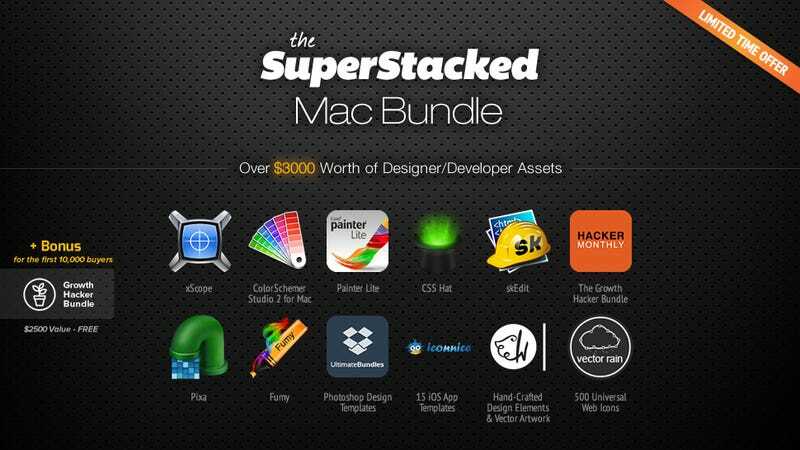 Combining 7 mac apps, 12 web apps, and design resources, we think this bundle (valued at over $3k) is a good deal for $48. We know you guys love bundles - so enjoy :) This bundle is headlined by xScope (a Designer's best friend), and a handful of other Mac apps. We also included the Growth Hacker Bundle (normally $35 on its own). It features "Pro" level subscriptions to web apps like Moz, AdRoll, SendGrid, and more. If you're looking to build your own website or start a web business - this bundle is a great toolkit. Fumy ($20) - Paint with smoke! StackSocial curates exclusive, hand-picked deals on trending and innovative digital products. They've partnered with the commerce team to bring you these specials. So to be clear, this post is not editorial and we make money on sales.